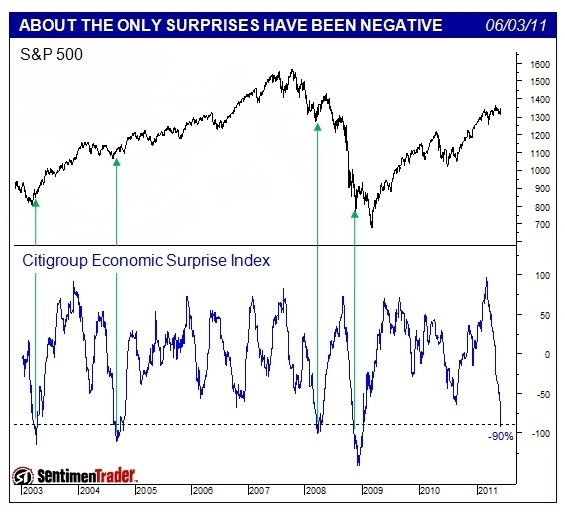 The Citigroup Economic Surprise Indices are objective and quantitative measures of economic news. They are defined as weighted historical standard deviations of data surprises (actual releases vs Bloomberg survey median). A positive reading of the Economic Surprise Index suggests that economic releases have on balance beating consensus. The indices are calculated daily in a rolling three-month window. The weights of economic indicators are derived from relative high-frequency spot FX impacts of 1 standard deviaion data surprises. The indices also employ a time decay function to replicate the limited memory of markets. As any avid market follower knows, economic numbers have been unusually disappointing as of late. According to the CESI the rise in data disappointment has been the strongest and deepest since the recession. At current levels, Citi’s surprise index is the lowest it has been since January 2009, but as recently as March, the index was at a record high (since 2003). This means that, earlier this year, when economists were still worried about the second-half slowdown in 2010, data consistently surprised to the upside. Then, when economists started to get comfortable with the idea that the recovery was just fine, data consistently surprised to the downside. In short, economists became overly optimistic and now, just a few short weeks later, they are overly pessimistic! A top in a bull market is characterized by a general unwillingness by the bulls to throw in the towel in light of negative news. Given how rapidly the Economic Surprise Index has fallen over the last 6 weeks or so and how the Dow has only fallen by some 6%, the latest round of weakness in US equity markets has all the hallmarks of being just another “conventional” market correction rather than being a long-term cyclical top in the major market equity indices. Other market sentiment indicators such as the AAII survey etc are suggesting that sentiment is either equal to, or at least not far off from, the lows reached after last year’s flash crash. A very powerful case can be made for there being limited downside in major market US equity indices. I continue to say to clients that one should see any weakness in large cap US stocks as a buying opportunity rather than reason to panic and sell. Previous What's the Best Buy in Silver These Days? Next P/E Ratio of S&P 500 at 9 Month Low! Is It Time to Buy?